As is now traditional, the Museum and Tearoom were reopened for volunteers and visitors to mark Remembrance Sunday and after recent appalling wet weather, the day was blessed with bright sunshine. A 2-minute silence was observed at precisely 11am preceded by The Last Post and within a short moment after the dying notes of Reveille sounded across the Teagarden, a familiar sound was heard approaching. 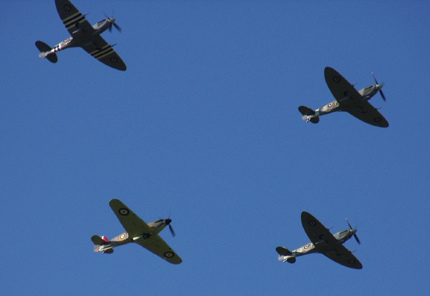 To the delight of everyone, the sound of a Merlin chorus turned into the glorious sight of 3 Spitfires accompanied by a Hurricane that flew in terrific formation over the Museum, before sweeping around the village for another pass-by the Museum and returning to nearby Biggin Hill. Massive thanks goes to the Biggin Hill Heritage Hangar team for so generously taking to the skies to thrill so many people on the ground in an unbeatable and fitting Remembrance tribute. The Team themselves visited the Museum later in the afternoon and kindly brought along 222 Squadron veteran Bob Duckett. It has been extremely saddening to learn of the passing of the very great and wonderful Tony Iveson, ‘One of The Few’ and a ‘Bomber Boy’. 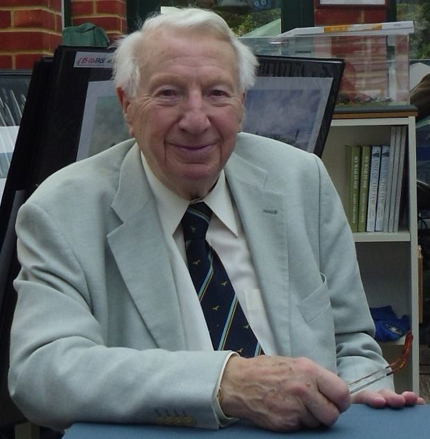 Tony was a regular and popular veteran visitor to the Shoreham Aircraft Museum, supporting many fund-raising events in aid of the Battle of Britain London Monument, the Bomber Command Memorial and various Museum projects. 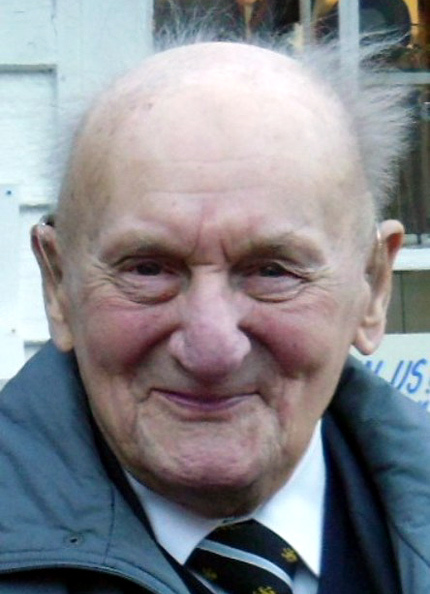 In his distinguished RAF career, Tony served with 616 & 92 Squadrons during the Battle of Britain flying Supermarine Spitfires and later in the war flew Avro Lancasters with 617 Squadron, participating in the famous attacks on the German battleship Tirpitz, including the raid that sank the mighty warship on 12th November 1944. In January 1945 Tony earned a well deserved Distinguished Flying Cross after bringing his crew safely home in their shot-up Lancaster after a raid on Bergen in Norway. Tony will be much missed, but never forgotten. You are currently browsing the Shoreham Aircraft Museum – News archives for November, 2013.